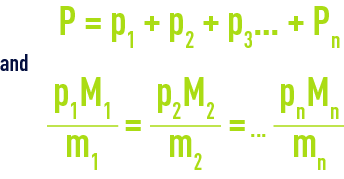 in the gas phase: Dalton’s law and the ideal gas law. CL and Cg are the gas concentrations in the liquid and gas phases that are only accessible to measurement. CiL, and Cig. are the concentrations at the interface, kL and kg being the transfer coefficients in the liquid and gas phases that are dependant on the interface and on turbulence conditions. using high levels of turbulence for each of these 2 phases.